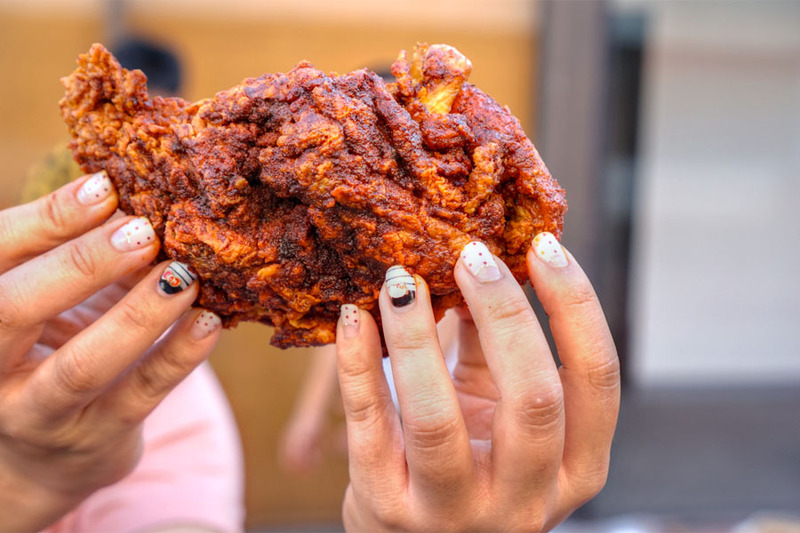 The hottest fried chicken joint to hit LA in a while comes to us courtesy of Johnny Zone, whom I last reported on back in 2011 when he had just taken over the reins at La Poubelle. The Chef's road to Howlin' Ray's began in 2014, when he staged at Sean Brock's Husk. 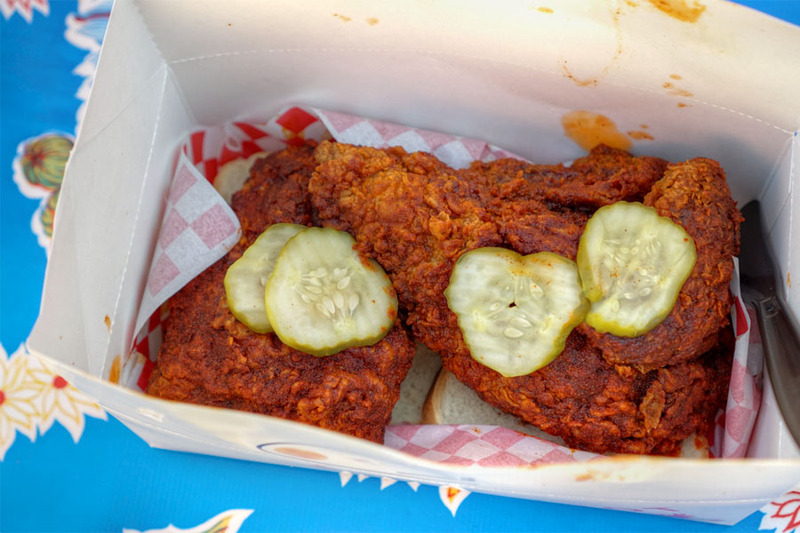 During his time there, he was introduced to Nashville hot chicken, a cayenne-heavy style supposedly developed in the City during the 1930s. 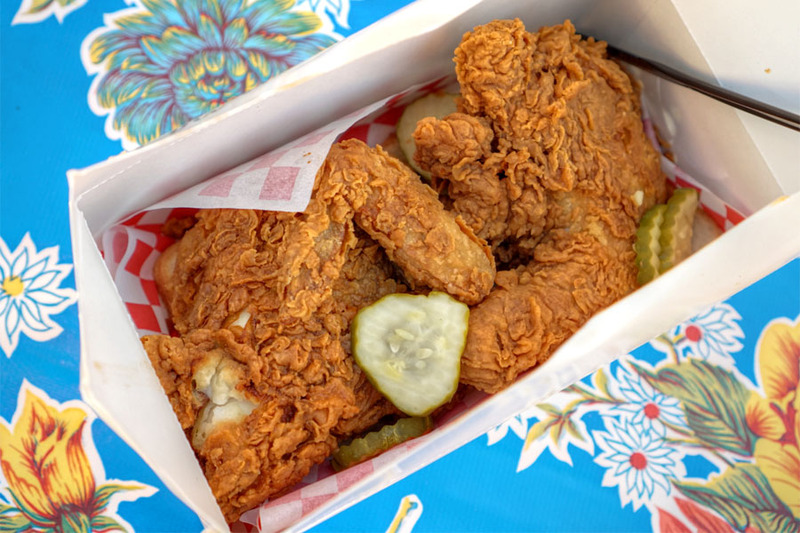 Zone fell in love with the fried chicken, and subsequently spent more time in Nashville in order to learn more about it. 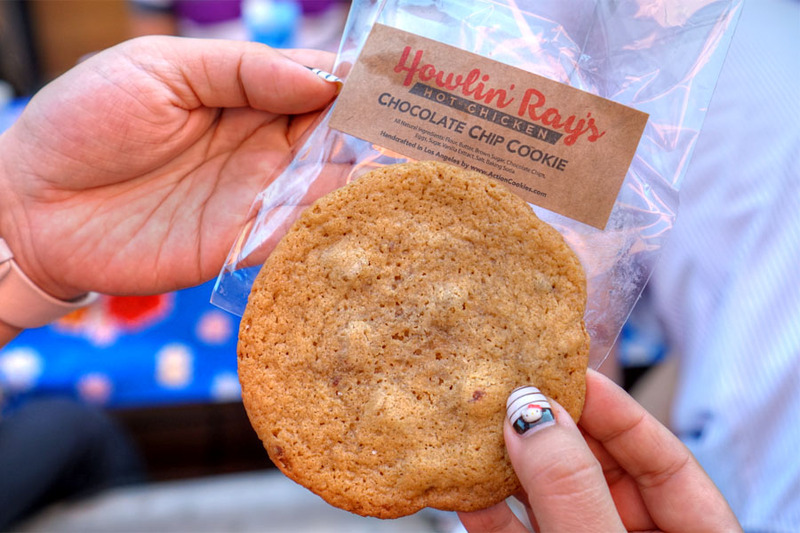 He reportedly took almost a year to perfect his recipe, and eventually he and wife Amanda Chapman launched the Howlin' Ray's food truck in June 2015 after first popping up at Barrel & Ashes (Zone worked with CdC Michael Kahikina at Bouchon). 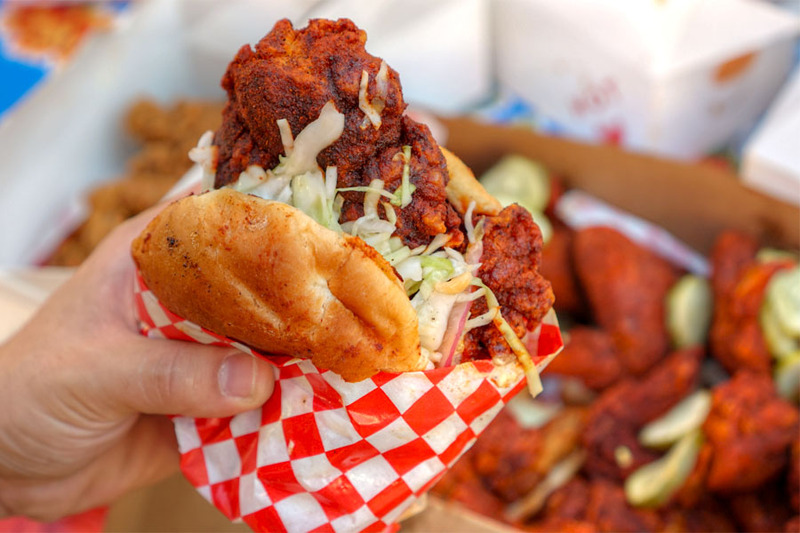 Given the success of the truck, in October 2015 it was announced that Howlin' Ray's would be taking over the former Littlefork space in Hollywood, but the deal fell through just weeks later. Then, in December, Zone and company revealed that they'd secured a spot in Chinatown's Far East Plaza, right next door to Pok Pok Phat Thai (which subsequently shuttered and is now Baohaus). 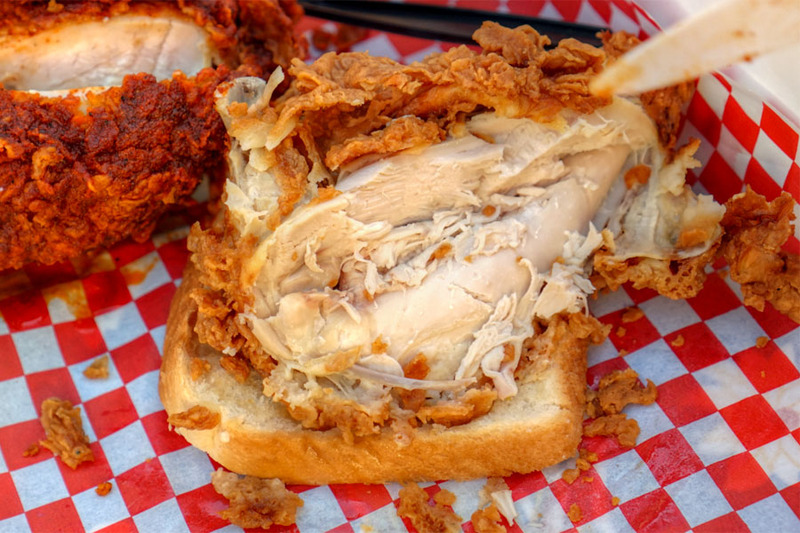 Howlin' Ray's thus debuted in April to considerable fanfare and even more considerable lines. 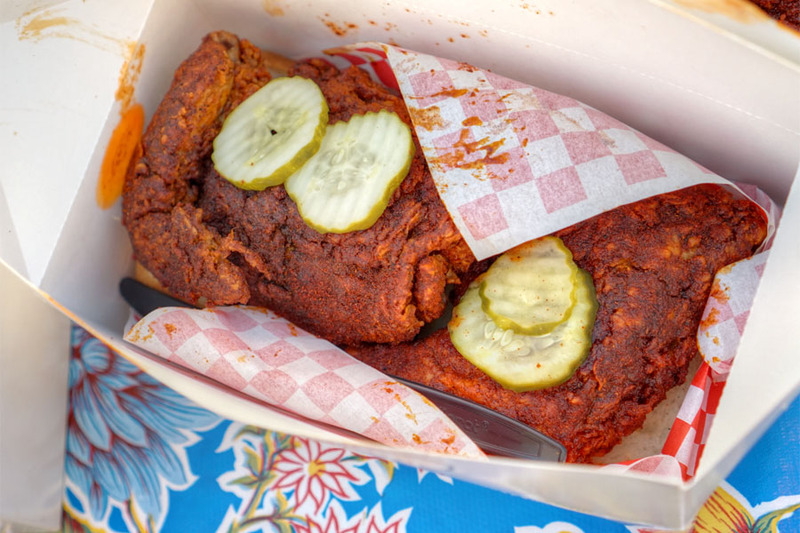 Menu-wise, Howlin' Ray's is all about that cayenne-laced bird, which is available in six heat levels and served with traditional accompaniments of bread and pickles. 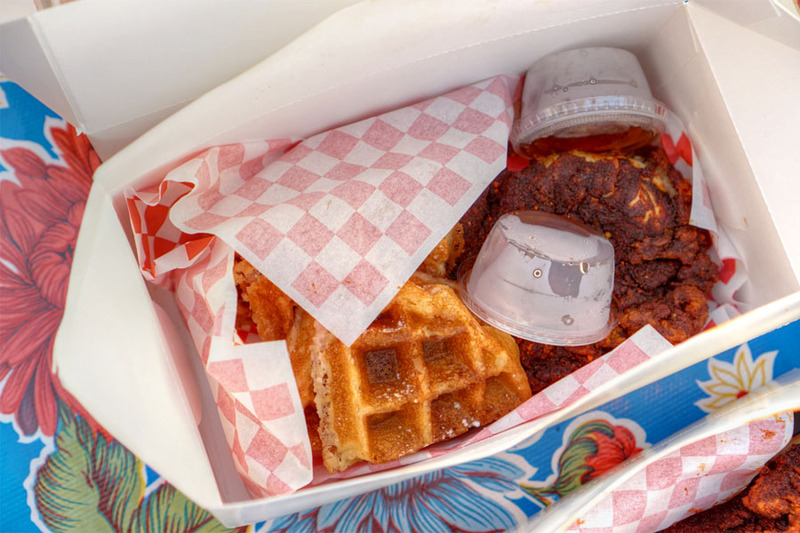 There's also a sandwich option, a handful of sides, as well as a chicken 'n' waffles combination on weekends. Click for a larger version. We ended up ordering a bunch of stuff to share, and first up was one of my favorites. 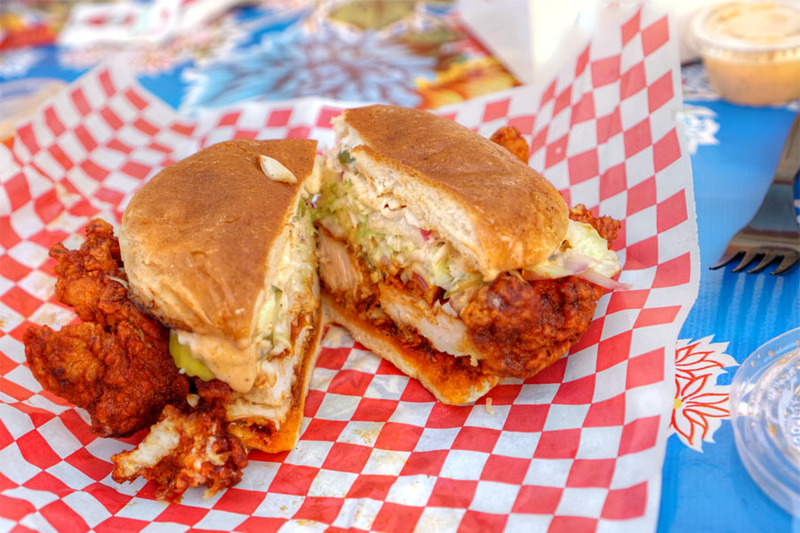 This was a pretty much spot on fried chicken sandwich, one with just enough spice, just enough tanginess from the bird to match the crunch and acidity of the pickles and slaw. If I were coming here on a regular basis, this would be probably what I'd get most of the time. Start with this. 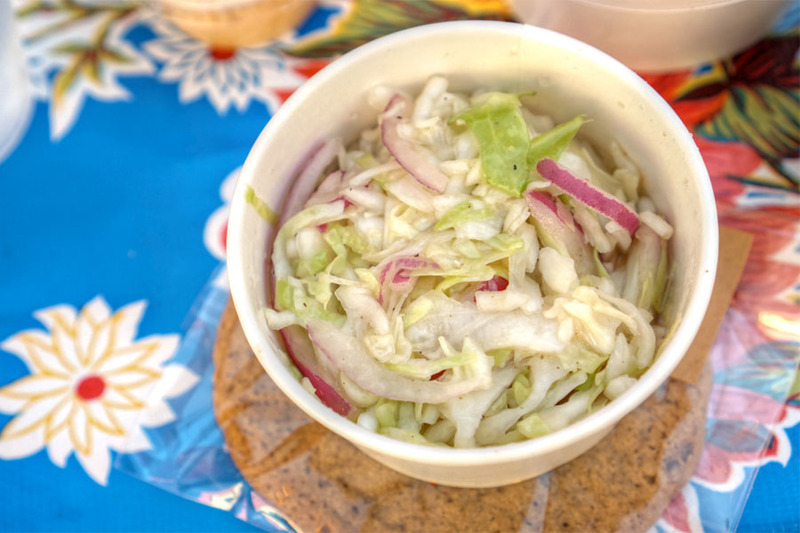 Speaking of coleslaw, the example today ate crisp and tart, but also showed off a marked sweetness. 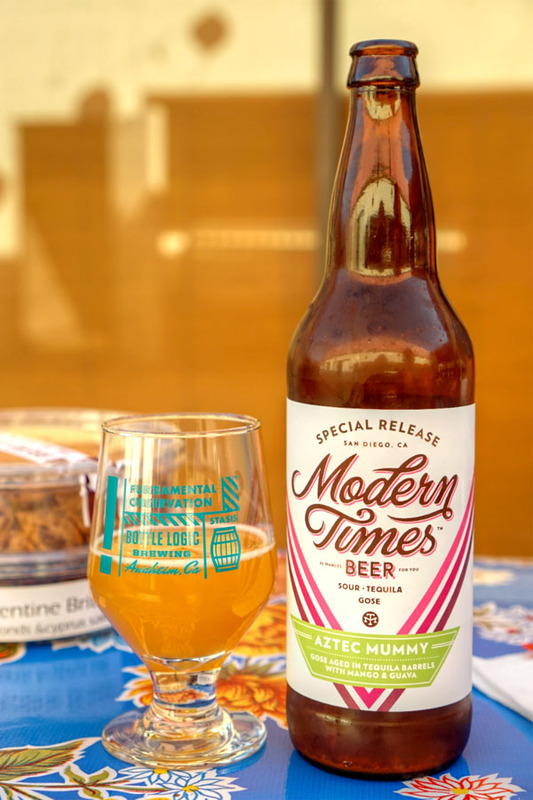 In terms of beverages, we opted for a few beers, the first of which was the 2016 Modern Times Aztec Mummy with Mango & Guava, a tequila barrel-aged gose. This one smelled inviting, with plenty of fresh, super tropical aromas abound. The taste showed off more tart, true-to-life fruit at first, but with the woody, peppery kick of the tequila barrel appearing on the finish. We ordered the no-heat version of the chicken in order to experience the inherent goodness of the bird, and it was good. In fact, it was arguably my favorite item we had: juicy, tender, flavorful, with crisp, crackly skin that made it a joy to eat. Next to drink was a bourbon barrel-aged imperial stout with coffee from Mostra, the 2016 Cycle 3rd Anniversary BA Vietnamese (Da Lat). Nose was lovely, filled with dark fruit and spice. The palate wasn't quite as inviting, but still tasty, displaying lots of oak, spice, and light roast. 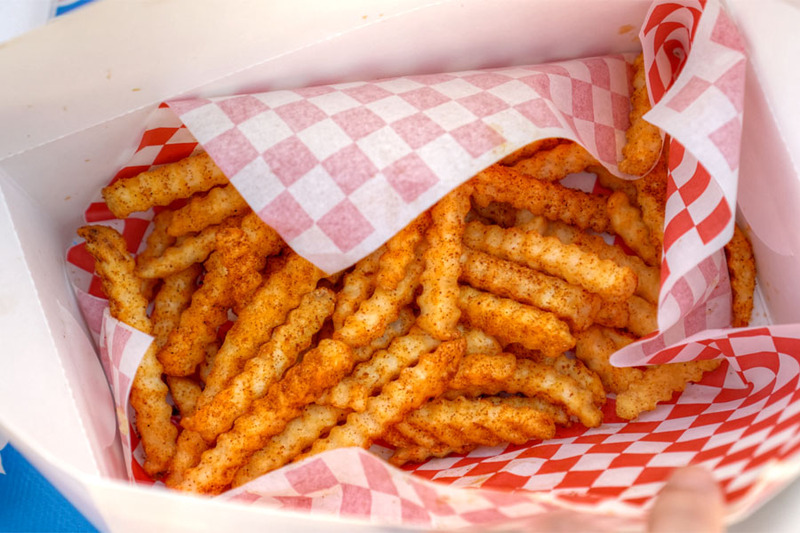 Fries were well-textured and quite healthily spiced. Compared to the sandwich above, this was noticeably hotter, with a longer lasting burn to boot, though again, the slaw did help. The spiciest I'd go under normal circumstances. 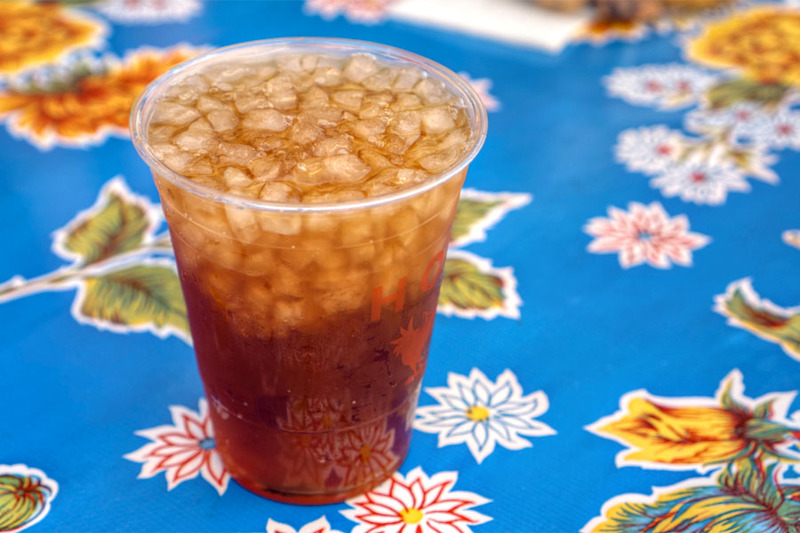 The Peach Tea [$3] worked well enough, conveying more of your classic tea notes at first, but with the stone fruit appearing mid way through and lingering. The 2016 Beachwood Blendery Propagation Series: No. 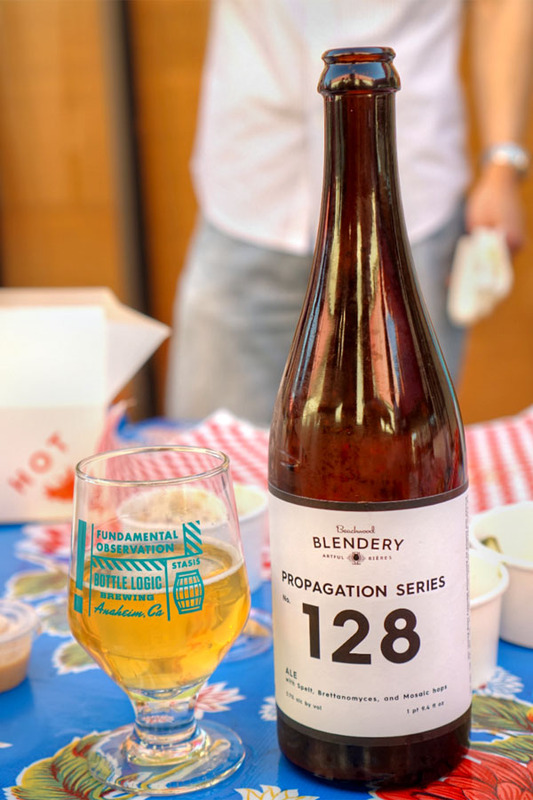 128 was a saison-style, Brett-fermented ale with spelt, dry-hopped with Mosaic. This one smelled refreshingly citrusy and just hoppy enough. The taste, meanwhile, was similarly bright, with more of an herbiness and a trace of spice. 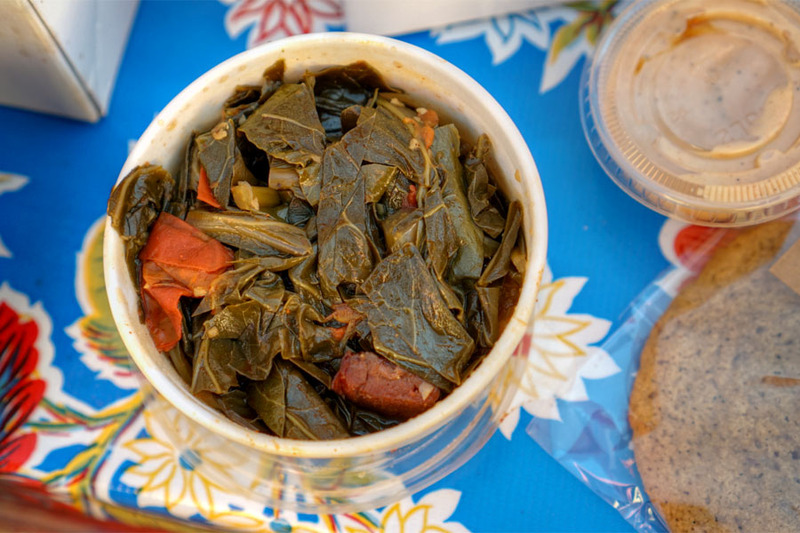 Collards were just what you'd expect: earthy, bitter, deep. For me, Medium was the borderline of eating semi-comfortably, though I will say that the higher meat-to-skin ratio of the breast did help temper the heat. 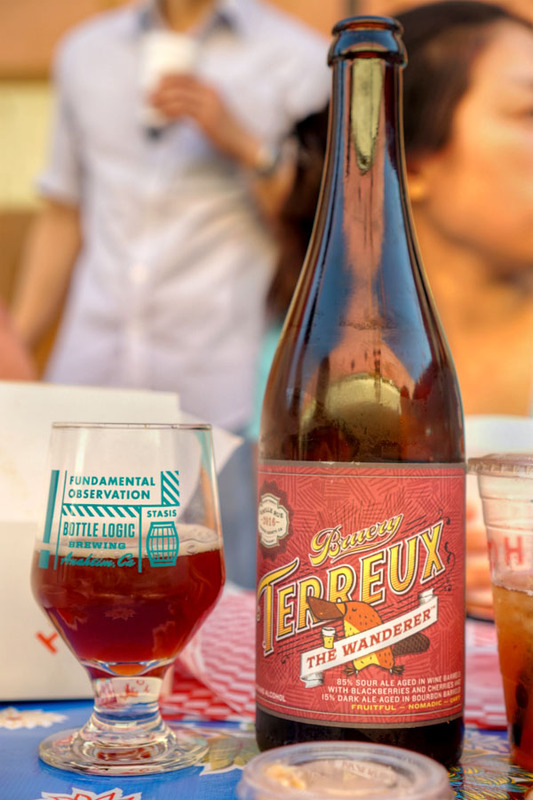 The 2016 Bruery Terreux The Wanderer comprised a blend of wine barrel-aged sour ale with blackberries/cherries and bourbon barrel-aged dark ale. I found the nose here filled with tart, dark fruit and oak, and the taste brimming with more oak, earth, acidity, wine-like notes, and of course berry fruit. 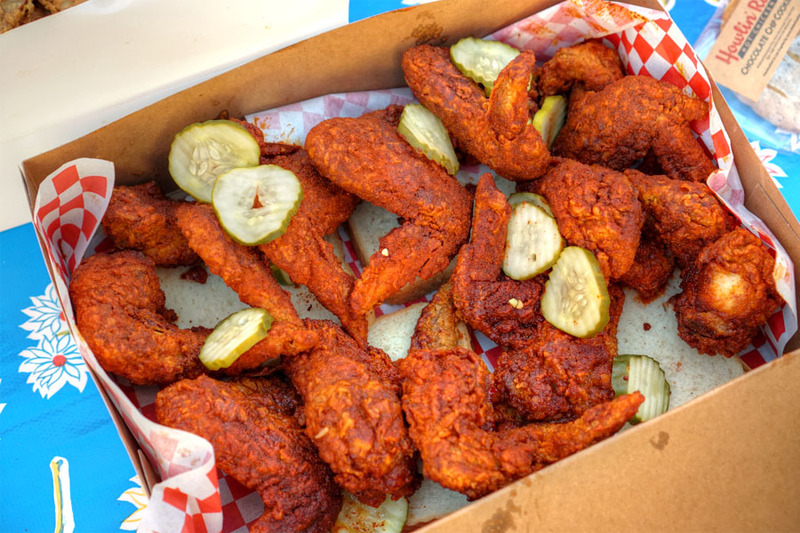 The wings definitely seemed more cayenne-forward than the other cuts due to the smaller amount of meat present. 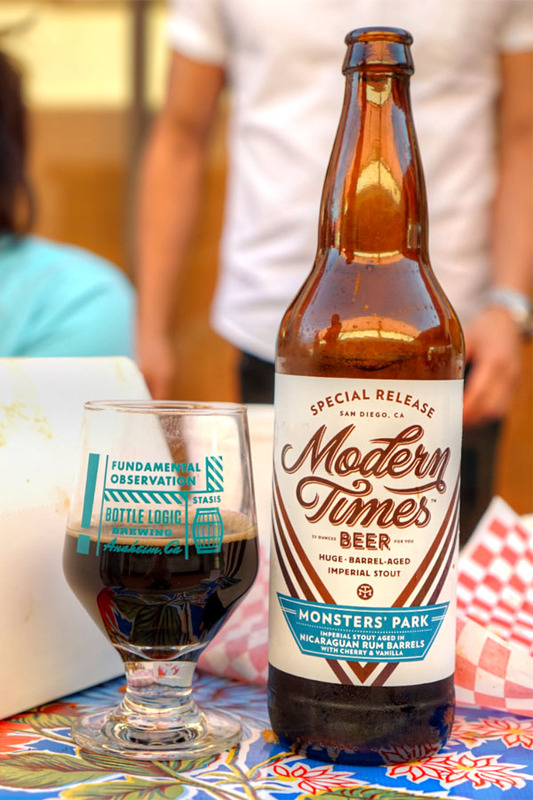 Here was an imperial stout, the 2016 Modern Times Monsters' Park Aged in Nicaraguan Rum Barrels with Cherries & Vanilla. Bouquet on this one was teeming with cocoa and a good amount of the advertised vanilla. There wasn't much vanilla on the palate though, which instead showcased more chocolate, malt, and the dark fruit character of the cherry toward the back end. 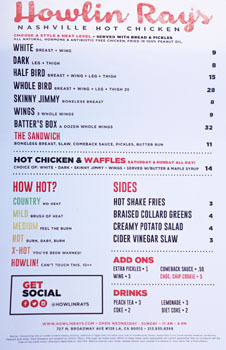 Naturally, we had to try the marquee Howlin' spice level, though at least we had the sense to get it in sandwich form. Interestingly, the heat here was less overtly cayenne but rather a more focused, sharper pungency (which makes sense given that the marinade reportedly incorporates bhut jolokia, Habaneros, and Carolina Reapers) that actually had a multi-second delay before it hit you, and stayed with you. One of my dining companions reported dizziness upon eating, while another was forced to rush over to Scoops for ice cream. I was only able to come out relatively unscathed by consuming an inordinately small portion. The Lemonade [$3] was pretty prototypical--not too sweet, not too sour. 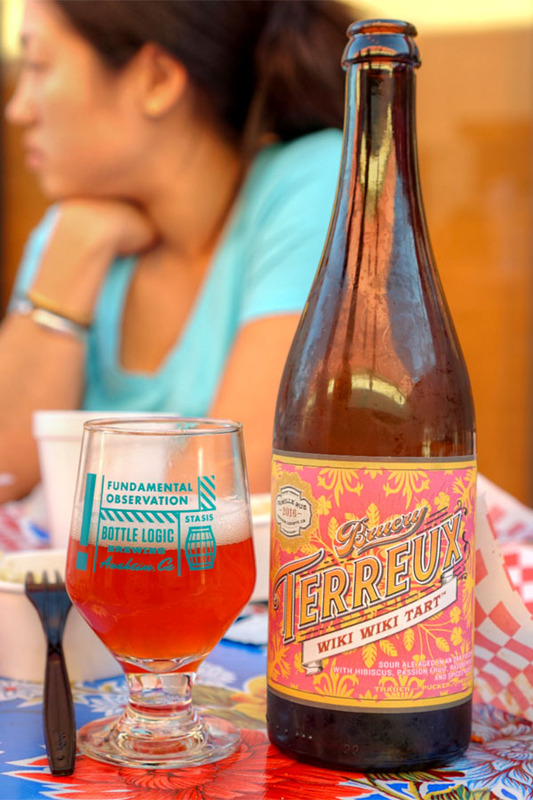 Next up came an oak-aged sour with hibiscus, passion fruit, raspberry, and spices, the 2016 Bruery Terreux Wiki Wiki Tart. Not surprisingly, the nose here was super tart 'n' fruity, with a distinct sweet spice element. The taste brought more sour, tropical, floral notes along with an underlying graininess. Fun and easy drinking for sure. 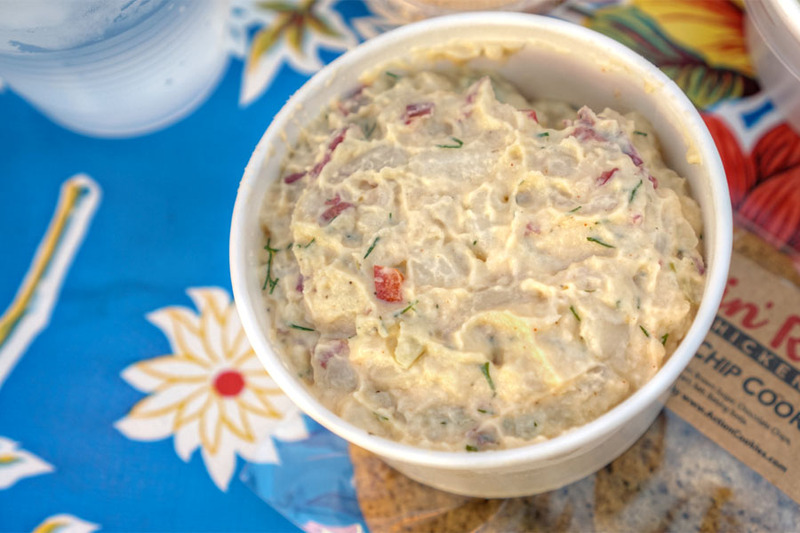 The potato salad was a classic, and indeed creamy preparation. Quite tasty, though I actually wanted a bit more texture. 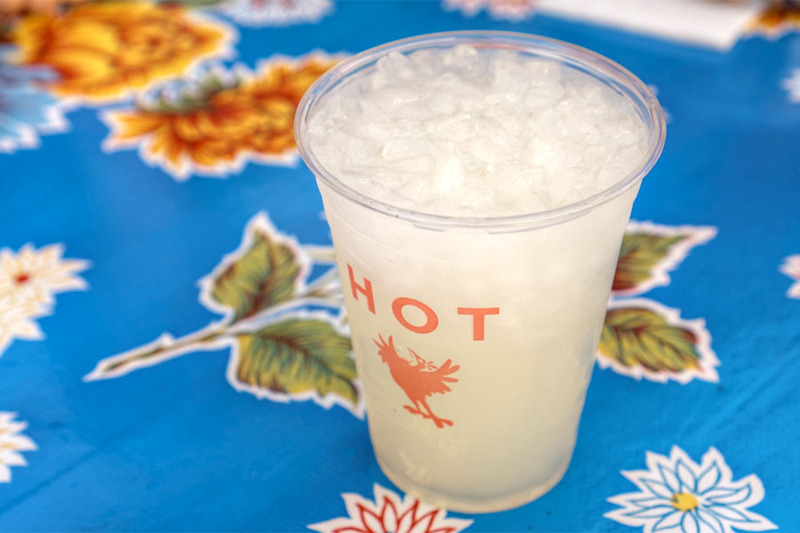 The Hot was a perceptible step up from the Medium above. This one creeps up on you a bit too, and I found it barely bearable for more than a few bites. 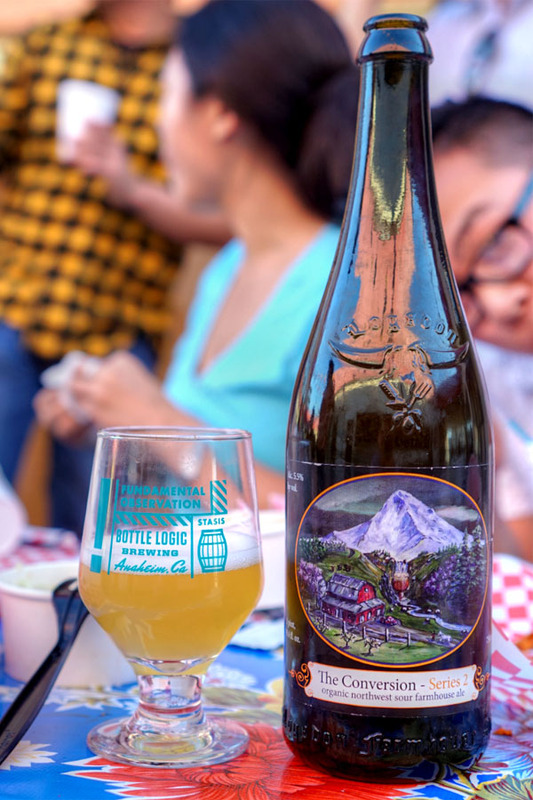 The 2016 Logsdon The Conversion - Series 2 was a sour, Belgian-style, wildly-fermented witbier. Aromas here were super funky, super lemony. The taste followed, with more farmhouse and a not all that inviting astringency (cleaning agent?) rounding things out. I managed to tame the second hottest heat level by piling on plenty of the included maple syrup and stuffing my mouth with waffle. However, one of my fellow dining companions wasn't so lucky, as he reported hearing loss in his left ear after eating. 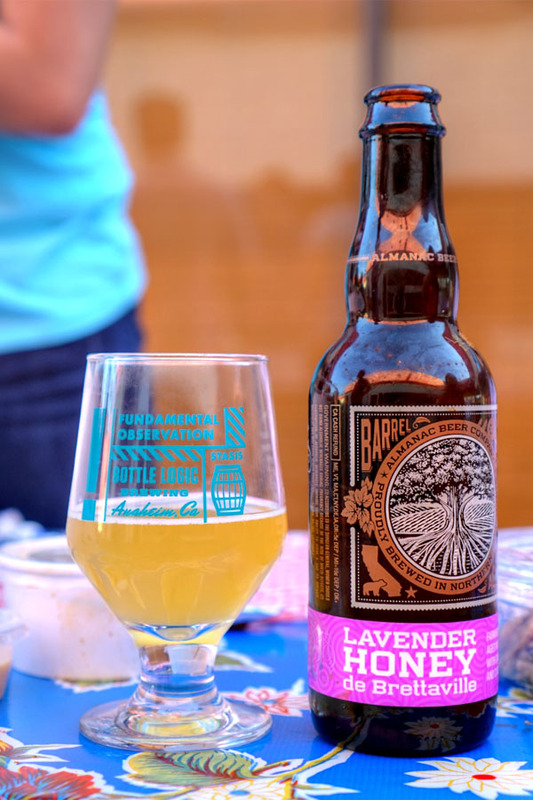 Our final beverage was the 2016 Almanac Lavender Honey de Brettaville, a farmhouse ale aged in oak with lavender, honey, and Cara Cara oranges. It had a nose filled with floral, herbaceous nuances along with a pervasive tanginess. The palate veered super herby at first, with a bitterness coming in on the mid palate and the beer finishing with lots of lavender. I'll take the perhaps unpopular stance that you should go easy on the heat here. A number of us at the table actually agreed that we liked the Country-style prep the most. It's just a really good fried chicken, some of the best I've had in fact. I'm not so sure that all the cayenne really improves the experience, though in moderation (up to Medium) it does add a further dimension that works. Go any higher, and you're sort of missing out on the quality of the actual bird. And Howlin'? Masochism or machismo I say. Great write up Kevin! 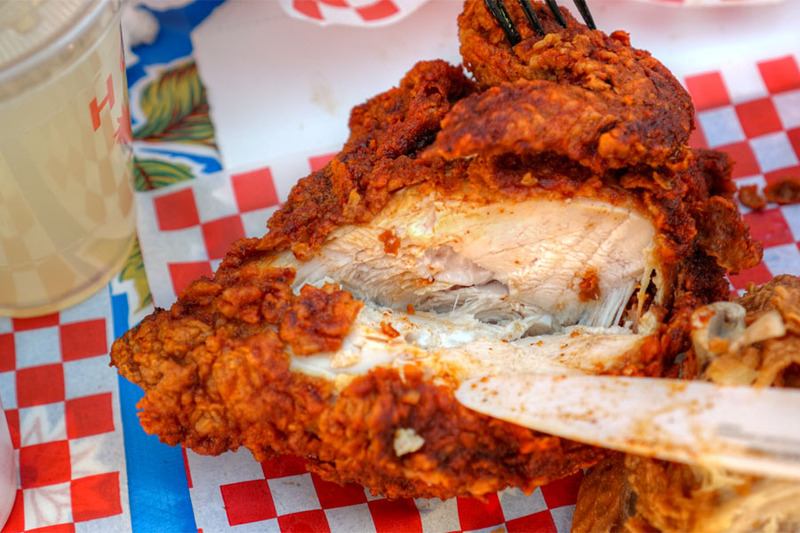 How does this place compare to Gus' Fried Chicken? I've never been to either, but Jonathan Gold gave it raving reviews. BTW, where do you find your craft beers? 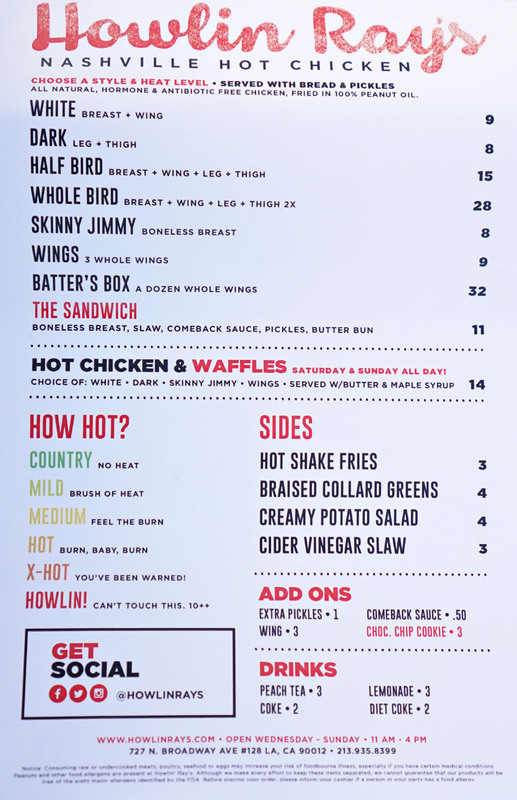 Howlin' Rays is on a different level than Gus because they use much higher quality chicken and have a religious adherence to quality control. 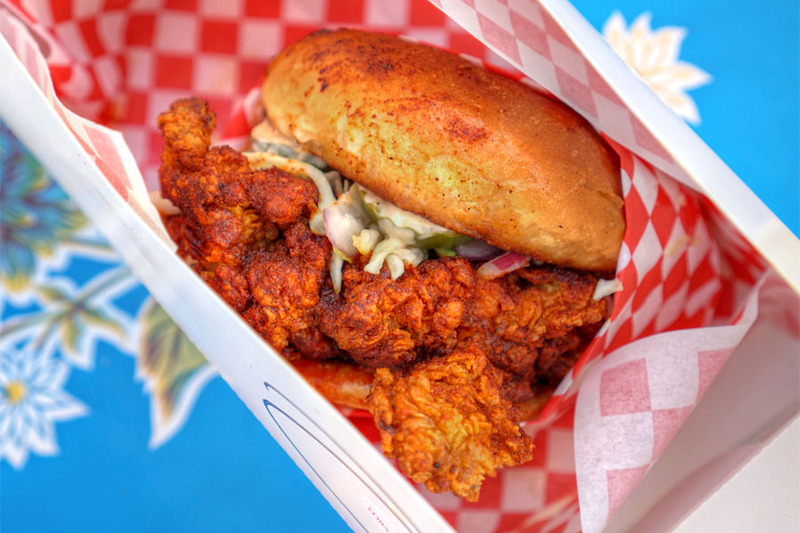 Howlin' Rays is run like a michelin starred kitchen. It is good to know you can drink alcohol on the benches outside, I didn't realize that was legal! I need to start brining some stuff with me from now on! The jump from Medium to Hot is exponential in spice level. my fave fried chicken sandie spot. actually ran into jonathan gold there. he was there with his entire family and he actually told me try Howlin'. i've never regretted listening to him so much. i really enjoy the country sandwich. and the pickles! How long was your wait? The wait was insane, the country chicken superb. Every piece is cooked to order, which makes a difference. Nancy: Unfortunately I've not been to Gus', so I can't comment, but I'm sure both places have their charms. As for the beers, the Modern Times and Bruery stuff I get from their membership clubs. 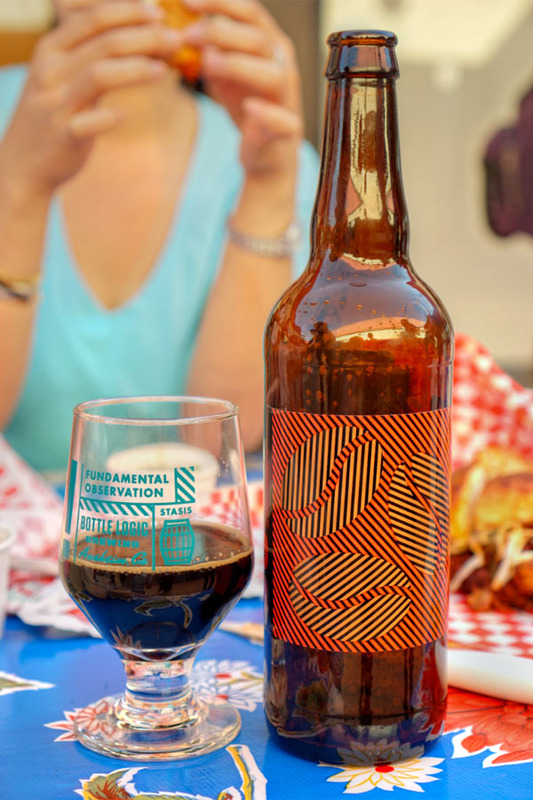 The Cycle was from a trade, the Propagation was purchased directly from the brewery, the Almanac was from a local bottle shop, and the Logsdon was from a bottle shop in Portland. Micah: Ah thanks, I've made the correction about the pepper extracts. As for the drinking, it's not officially condoned, but tolerated it seems. I'm not sure what the license situation here is, since Wing Hop Fung *was* selling hard liquor after all. Charlie: Would all the other steps be linear then? Daniel: Ha, was the Howlin' a "24 hour process," as they say? Frank: It was about an hour, which I guess wasn't too bad given that we went on a weekend afternoon. Anon: Did not know that each piece is cooked to order! i actually asked if i could change, and he was gracious enough to give me in medium. i'm going to be sticking to country. but seriously love the sandwich and the team there. super awesome couple and the food. Very glad I read your review before I went. Otherwise, i might not have ordered the country style. Tried that with the medium and hot and we all felt the hot was not worth getting again. Though the heat level was tolerable, there was no flavor but heat. For me, the country was best, but two others felt that or medium were equally good.